Sunrise over Boulder Beach Acadia National Park, Maine, October 4, 2016, 06:37 My buddy, Scott Stulberg, taught a fall workshop in Acadia National Park and I helped out as a guest instructor for a couple days. What a great group of people—we had a lot of fun! This is a single row panorama of sunrise at Boulder Beach. I kept it low key for an exposure because I didn’t want to overexpose the sun or sky and I liked the deep, rich colors of dawn’s first light on the cliffs and boulders, as well as the silhouette of the photographers to the left. 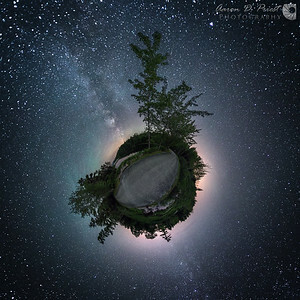 The stitched image is 36372 x 7275 or ~265 megapixels and 152 x 30 inches as a print. 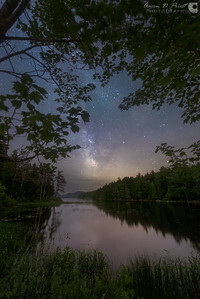 Camera settings: 70mm, f/18, ISO 64, 1/5 sec Stitching data: 1 rows of 11 images Equipment used: Nikon D810, Nikon 70-200mm f/2.8, Nodal Ninja RD16-II rotator, and Really Right Stuff TVC-34L tripod & panning head. RAW conversion via Lightroom, aligned via PTGui, and manually blended via masks in Photoshop. Planned with PhotoPills. This is the wharf at Thurston’s Lobster Pound in Bernard, Maine on September 12, 2016, 17:56. 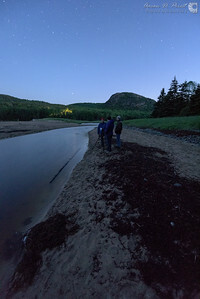 I took it during a panorama workshop that I was co-instructing with Acadia Images Photography Workshops. The wharf was in shade while the sun was hitting the boats in Bass Harbor in the background. 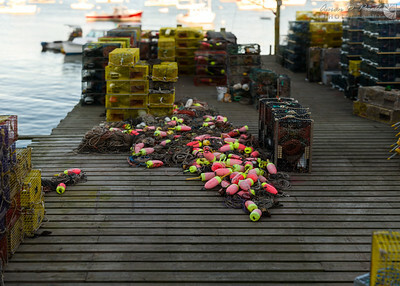 I wanted a selective focus on the buoys and ropes with the lobster traps and harbor providing a blurry backdrop and plenty of negative space on the wharf in front of the pile of buoys to blur as well, like a tilt/shift lens effect. It’s about a 48mm field of view, so I could have shot it with a 45mm f/2.8 tilt/shift lens, but I don’t own one. ;-) Instead, I used my 70-200mm f/2.8 at 200mm, f/2.8, ISO 64, 1/160, focused on the buoy I wanted to be the sharpest, chose the corners of my scene, and shot a bokehrama of 7 columns and 6 rows. I rotated every 5° and tilted every 5° for plenty of overlap, because the focus distance was only 29 feet away and the blurred out foreground was even closer. I aligned it with PTGui Pro and blended it with Photoshop. I cropped it to a 5 x 7 ratio for easy printing because that’s nearly what it was already after stitching. The finished panorama is a little over 630 megapixels (29735 x 21239) and can easily be printed 10 x 7 feet without enlarging. 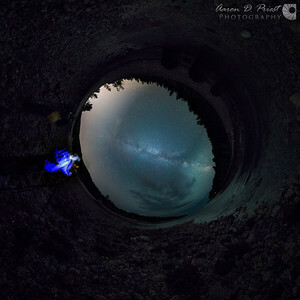 The full panorama can be explored here. Zoom in to see how much detail there is: http://www.aaronpriestphoto.com/panorama/2016/2016-09-12_BassHarbor/ Camera settings: 200mm, f/2.8, ISO 64, 1/160. Stitching data: 6 rows of 7 images for a total of 42 images. Equipment used: Nikon D810, Nikon 70-200mm f/2.8 VR II, Really Right Stuff TVC-34L tripod & pano/gimbal head. RAW conversion to 16-bit TIFF via Lightroom, aligned via PTGui Pro, and blended in Photoshop. 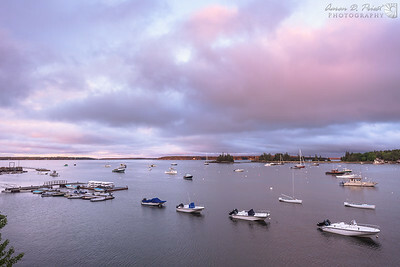 Mount Desert Island, Maine, July 31, 2016, 20:05 A lot of effort goes into a gigapan, especially at sunset with rapidly changing light and in a harbor with moving boats and waves. 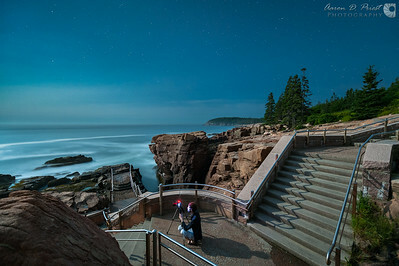 There are several stages of work to any good photo: planning, shooting, post-processing, printing / display, and with panoramas you have to add stitching and blending of course. The planning phase is probably the most critical for a successful stitch later though. 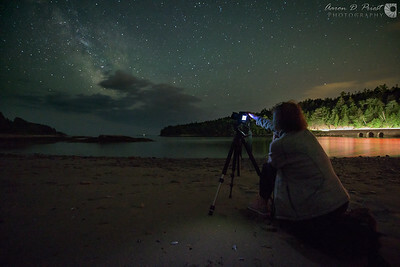 Location and time of day are obviously two important steps of planning, as is choosing your subject and field of view to know what focal length and aperture would best isolate your subject or place your subject in its environment. You may even have several subjects in a wide landscape. In this scene, the color of the sky, the reflection on the water, and the people getting off the boat on the pier were what I chose to be my focus. I let the railing and edge of shoreline be the natural border of the scene. I don’t always center my horizon line, but for a reflection it emphasizes the mirrored effect and it juxtaposed the dipping arch of the boats in the foreground lined up left to center below the horizon and the rising arch of the hill in the background from center to right above the horizon. The swooping S through the scene helps break up the centered horizon line. Next was choosing my focal length, once I knew how much of the scene I was going to shoot. 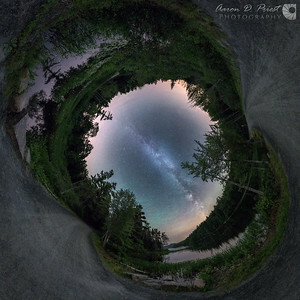 The horizontal angle of view was 160° wide, and it would take a non-existent 3.2mm lens to cover such an extreme angle, so it goes without saying that stitching multiple photos was obviously going to be the answer. But what focal length? 40mm would have covered the vertical field of view with a single row in portrait orientation and taken 6 images to reach 158° wide with a 25% overlap, but the resolution would only be 167 megapixels and I wanted much more detail, especially of the people on the distant dock. 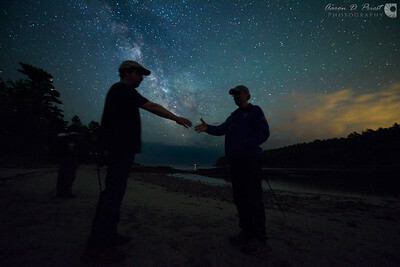 On the other hand, at 200mm it would have taken 31 columns of 6 rows for a total of 186 images and the stitched panorama would be 4.3 gigapixels, but I didn’t feel I had enough time with the people leaving the dock and setting sun to capture that many images. I also had moving boats and waves to contend with. In the end, I settled on 110mm and here’s the critical reason why: it captured the full mast and reflection of the tallest boat in the harbor in a single image, which would make masking and deghosting MUCH easier in post-production later when stitching and blending. It also meant I could capture the entire scene in 51 images (17 columns of 3 rows) before the light disappeared. I turned every 10° horizontally and 15° vertically for about a 39% horizontal overlap and 38% vertical overlap so I would have plenty of material for blending and deghosting moving boats and waves. It took about 6 minutes to capture all the images so the light was fairly consistent and the clouds didn’t move far. I started in the lower left hand corner and zigzagged so I would be shooting the darkest area first and the brightest area last for more even lighting, since the light was fading and the scene was getting darker. I would do the opposite for a sunrise panorama. The final, cropped image wound up being 65899 x 19926 or 1.3 gigapixels, so it was a good compromise and I still hit my goal of a gigapan. The hyperfocal distance of a 110mm lens at f/8 is 50m where everything from 25m to infinity should be acceptably sharp. This assumes a much smaller print size than zooming into 100% in a gigapan though. I probably should have chosen at least f/11 or f/13 for more depth of field, but I was also down to 1/20 shutter speed and up to ISO 200 for an exposure and I didn’t want to raise my ISO to 2500. I couldn’t go with a longer shutter speed either without blurred boats from the waves. So I chose f/8, focused on a boat in the middle of the harbor (30m away), took a couple near and far test shots, and confirmed it was an acceptable compromise. Everything in photography is a compromise, as Joe DiMaggio is fond of saying! 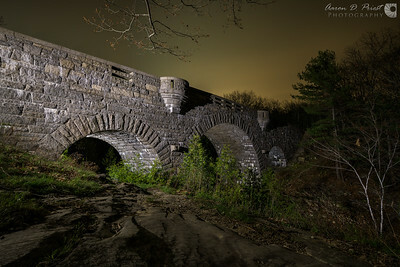 Camera settings: 110mm, f/8, ISO 200, 1/20 Stitching data: 3 rows of 17 images. 65899 x 19926 Equipment used: Nikon D810, Nikon 70-200mm f/2.8 VR II, Promote Control, and Really Right Stuff TVC-34L tripod w/ leveling base & pano/gimbal head. RAW conversion in Lightroom, aligned with PTGui, and manually blended via masks in Photoshop. Planned with PhotoPills. I took this panorama of fog and sunset over Bar Harbor from the top of Cadillac Mountain in Acadia National Park on June 6, 2016, 7:50 PM. It is stitched from 28 photos with Photoshop (it was too large for Lightroom). The sun was setting fast and the fog was moving fast too, so I shot a single row at 140mm, f/8, ISO 64, 1/20 sec. I didn’t have time for a second row or longer focal length. I chose f/8 and focused on the ridge where the hikers were because I liked the town and fog being slightly out of focus in the distance compared to the sharp outline of the ridge catching the last of the sun’s golden glow. Zoom in and pan around here: http://www.aaronpriestphoto.com/panorama/2016/2016-06-08_CadillacMtn/ Camera settings: 140mm, f/8, ISO 64, 1/25 Stitching data: 28 images in 1 row covering 155° vertical field of view, measuring 74179 x 7434 or 551 megapixels and can be printed 25 feet wide at 240dpi. Equipment used: Nikon D810, Nikon 24-70mm f/2.8 VR II, and Really Right Stuff TVC-34L tripod w/ leveling base & BH-55 ballhead. Edited with Lightroom. Stitched with Photoshop. 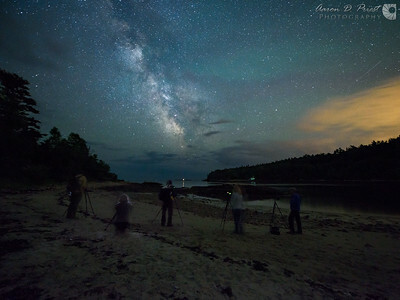 Charlie Widdis sets up a shot from the top of Great Hill in Acadia National Park. 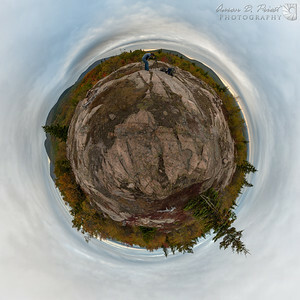 This is a little planet view of a spherical panorama. Stitching data: 28 images in 1 row covering 155° vertical field of view, measuring 74179 x 7434 or 551 megapixels and can be printed 25 feet wide at 240dpi. Equipment used: Nikon D810, Nikon 24-70mm f/2.8 VR II, and Really Right Stuff TVC-34L tripod w/ leveling base & BH-55 ballhead. Edited with Lightroom. Stitched with Photoshop.